The following contains mild spoilers for the beginning of Subnautica. The beginning hour of Subnautica is one of my favorites in any video game. It starts with a space ship exploding, a life pod ejecting and the player character getting knocked unconscious. Upon waking, they find the cabin of their life pod on fire and filling with smoke. A hasty sweep of the fire extinguisher helps get control of the situation. Heart rate decreases, a moment passes to breath and regain composure. Climbing the ladder of the life pod, the player emerges onto a beautiful and heartbreaking scene. The Aurora, the space ship that moments before they had been ejected from, lies in the water, smouldering and on fire. All around, for miles in every direction is an unbroken horizon of crystal blue water. No islands. No structures. You've got a knife and a fire extinguisher and a broken, barely functioning escape pod. Good luck. Subnautica is a survival game of the kind that has become all too prevalent on Steam. You've got a health meter and a water/hydration meter. There are crafting materials and blue prints of how to build things. 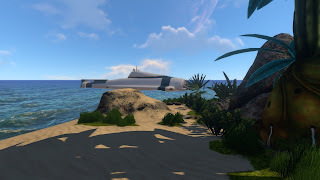 But unlike the blocks of Minecraft or the endless forests of other crafting games that ask you to punch a tree until you have enough wood to make an axe, Subnautica leaves you with only the endless waves and a crashed spaceship. Diving beneath the surface reveals another world of plants and fish and color and beauty. It's enough to lure you into the loop. Get food and water to stabilize your needs, then go out for crafting materials. Build tools. Repair your life pod. Repair your radio. There's no story here, no clever writing in these earlier moments aside from your PDA's helpful A.I. guiding you through the early motions of survival. The player character isn't named, they aren't even gendered aside from the grunted voice acting as you jump or hop or get bit by a shark. In these early moments there is only you, and the water, and the crashed ship and the will to survive, to explore. You can't swim that far from the life pod, you've only got so much air and it holds the precious fabricator that allows you to make clean water, well prepared food and your precious tools. That is of course until you get your first radio message. The player isn't the only one to have bailed off that crashing ship of course. There are others, their life pods failing, their lives slipping away as they sink beneath the waves. You can try to save them but you'll never make it. The ocean, the predators lurking beneath the waves, the mistakes of those trapped inside. Fate always gets there first and all that's left are the shattered remains left behind, the scraps that help you survive a bit longer. Your alone here, with only the ghosts of those who weren't lucky enough to survive to keep you company. This is only the first hour of a game a I spent fifty two hours in before rolling credits. Fifty two hours of crafting and fishing and making clean water and building habitats. Fifty two hours of the ocean, of a single enviroment, of a single landscape. Fifty two hours of a small subset of simplified mechanics in an ever shrinking sandbox devoid of NPCs or quests or loot drops. Why? Because of the Sunbeam. The Sunbeam is one of the first major story beats in Subnautica. It starts like most other things with a radio transmission. The Sunbeam is somewhere out there in the solar system, and they've gotten your distress call. The first message from their captain is him admonishing the entire crew of the Aurora for not answering the damn phone. The Aurora says it's in trouble, it calls asking for help but when we're returning your call you don't even bother to answer. How rude. Meanwhile you're in a tiny pod in an endless ocean with the view of a burning hulk to comfort you as the sun goes down and the temperature drops, left alone to enjoy your dinner of creeper, washing it down with water you milked out of a bladder fish. The next day you get another message. It's the Sunbeam's captain. They've detected the large debris field that used to be your ship. He's sorry, he's so damn sorry. After all, he spent the last call mocking a bunch of dead people for not bothering to get off their lazy butts and answer the phone. But's it okay. He offers hope. They're across the solar system, but they're coming to rescue you. To take you home. A few more days pass. I managed to build a small submersible craft called a Seamoth that let's me zip around the ocean floor. I built a small base and started raising crops. The Sunbeam sends me a new message everyday. They're getting close. They're looking for a place to land. They've found an island far to north, farther out then I've ever been. Don't worry they say, they'll be there soon. A count down timer appears on the HUD. I grabbed all the bottles of water and cured fish meat I could carry and stuffed it in my little submersible. I raced across the oceans, watching that little timer tick down, ignoring the calls of others in distress. I had to get there. I couldn't miss this chance. In this place I was so alone, but it was over now. I was going home. The site of land was mesmerizing. For all this time there had been only water, but here hidden behind the clouds was a tiny island. The landing zone was at the north side, I would make it there with plenty of time to spare. Then, rounding the island I saw a building, the first I had seen on this planet that I myself had not built. But it was wrong. Black, full of neon green lines at right angles. Guarded by a force field. Alien. So I explored the island. And I entered the facility and I learned that while I was alone, I was not the first to come here. But all the while the timer was ticking down. The Sunbeam was coming. I couldn't miss the pick up. Coming back up to planet, I heard the radio transmission. The Sunbeam was here, their captain saw the island. He saw me. They were touching down. This was it, I was going home. But then the building awoke and turned and looked suspiciously like a cannon. There was a flash of light, a burst of screams and then only static. The Sunbeam broke apart like my own ship had and was no more. I was alone again, more so, for the hope of rescue was now dashed. And I was hooked. Hooked on Subnautica and its story, whatever it turned out to be. Told in much maligned audio logs and journal entries, the story of Subnautica is told sparsely, with long hours of only the waves and the ambient music and the bubbles to keep you company. But it works, it works so well to flesh out the world and add layers to something that appears so flat, so unforgivably silent. This game is so stupidly pretty in motion. There are, arguably, too many survival games on Steam. Many of them follow the same model of punch a tree and get a stick. Add a stick and a rock and get an axe and go from there. It's the "go from there" where many of them fall apart. Sure their are things to craft and a tech tree to climb, but there's no real reason to do any of it. The latest trend in these games has been to add multiplayer, to hope the fun and the interesting stories will be player driven and dynamic. While this looks on the surface to be a decision born of wanting to give players an endless mix of new and interesting stories, it is actually a failure of design. Unable to come up with a solution for making the world interesting, they shift a design problem to being a technical one. While adding multiplayer to game isn't easy, it provides a set of logical steps that can followed and a clear indication of whether or not it's working. Building a world that is interesting to be in on its own is far more challenging. Worst of all, these games takes place in familiar forests and caves. Subnautica succeeds not only because they use their environment so well, but because they were willing to do something more with it. There are at least a half a dozen distinct areas within Subnautica, all hidden beneath the ocean waves and flowing seamlessly into one another. Each hides treasures and materials and story. Each biome is visually distinct, not only lodging it in the player's memory, but serving as its own reward. Each has new life forms, a new color palette, new challenges to be overcome. And that's why at its heart Subnautica isn't really a survival game at all. It's an exploration game that uses those survival elements to push forward that sense of exploration. Within minutes of playing Subnautica I was set up in a way that ensured I would never fail to survive. I had food. I had water. I had a first aid kit in case I danced too closely with a shark. I strove out into the wilderness, into that inherent risk because I wanted to see what was there. At first I wanted to search for wrecks, for pieces of the Aurora that had fallen so far from where I landed, to find blueprints and new things to assemble. Then I searched to look for new areas, new wonders and life forms, to scan them and build out my database. To catalogue and understand the world around me. Finally I went out in search of answers, of a cure for the mysteries that lie at the center of the ocean. It's a blueprint, a map, I wish more survival games followed. Way back on the Gameboy color there was a game series called Survival Kids, later Lost In Blue on the DS, that understood this well. Yeah there was a hunger meter and a thirst meter, but there were also ruins and puzzles and mysteries to uncover. So many games are about exploration. Of systems, of combat mechanics, of equipment and story. 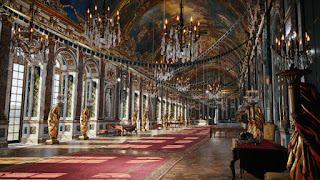 They have an unparalleled ability to show us new worlds and experiences. In many, many games I have walked through forests. I was walked through caves and put a rock and stick together to make an axe. In far too few games have I swam through them. In far too few games have I navigated my way through a sunken wreck, looking for treasure, keeping a mental route of the way I swam in so I knew how to get out before my air supply was empty. In far too few games have put an egg into a incubator just to learn what came out, not so I could get some upgrade, or a new companion, but because I wanted to better understand this world that I lived in. Subnautica isn't perfect. There are times when the game fails to render the scene fast enough. There was a time in which I was cruising through the ocean so quickly in my Seamoth that I hit an invisible wall, only for an entire wreck ship to materialize around me. There was of course, no way to get the Seamoth out at that point, for I had solved the mystery of how you put a ship in a bottle by some sort of quantum teleportation. There are times when things flicker and when fish swim through the air in your supposedly sealed underwater base like some sort of hunger induced hallucination. But these are minor quibbles, technical hurdles on an otherwise supremely well executed design. Subnautica is a world of beauty and of color and of interesting choices and stories that are all too few in the gaming landscape today. I deeply enjoyed Subnautica and the things I saw there will stick with me for some time. Take Note is series where we examine a single idea for others to consider. Spoiler Warning: The following article contains minor spoilers for Star Wars: The Last Jedi. The article below only talks about the space battles in the film. 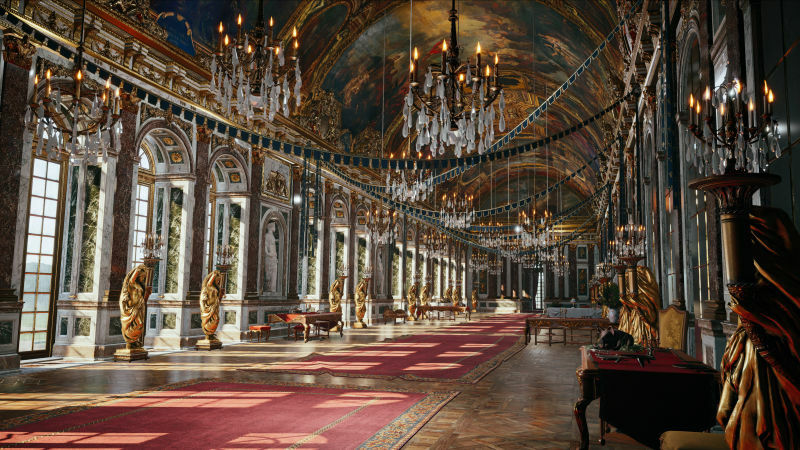 Characters and locations will be discussed loosely, and without names. If you're sensitive to that sort of thing, check back later. Everyone else, let's do this. One of the opening scenes in the latest Star Wars film, The Last Jedi, is a big space battle. I know, you're shocked. A big space battle in a film called Star Wars. I'll give you all a minute to catch your breath and finish clutching your pearls. Good? Good. It was during this scene that it occurred to me why Star Wars battles are so memorable, and why they work so well, even when they are largely inconsequential to the overall plot. These long movies, with several story lines to deal with, philosophies to expound on and secrets to reveal. Do they really have time to waste on all the pew pew and bang bang? More importantly, how do they get away with wasting time on them? In a film about space wizards fighting with laser swords, which is already pretty awesome, it's saying something that many of memorable moments come from rust buckets trying to gun each other down. Do you remember this guy? Looks familiar right? Do you know his name? I sure don't. But this, right here, is why Star Wars battles actually work. This guy isn't one of the heroes. He's not even an important second tier guy like Hawkeye or a recurring jokes like the Cabbage Vendor. Nope, this lovable fellow exists only so that a handful of minutes from now a lucky tie fighter pilot can turn him into charcoal. The obvious move here would be to say that Star Wars takes the time to show you the pilots, to humanize them. 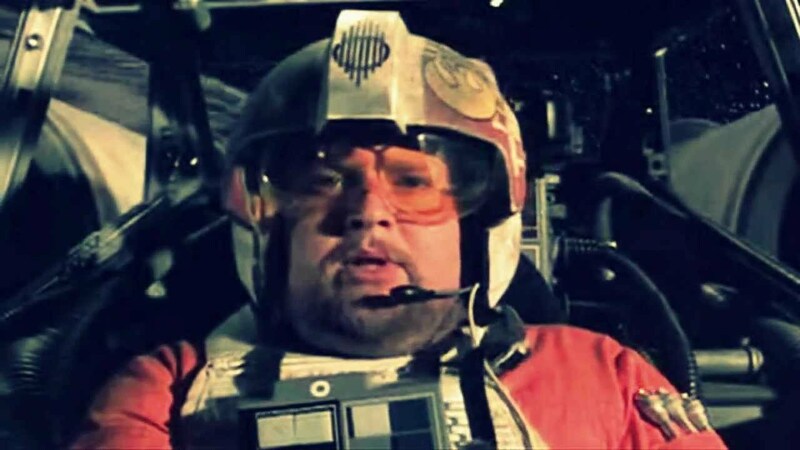 To remind us that behind the cockpit of those crafty X-Wings and speedy A-Wings are real people with real emotions. That in conflict, fighting for your ideals has a price. But in truth, you'd have gone to far. It's not that Star Wars takes the time to show you a human face, it's that Star Wars takes the time. The space battles in Star Wars have stakes. They have moves and counter moves. They have tactics and gambits that either pay off or fail and they have a resolution. In essence, they are a story unto themselves, a stage play of battleships and aircraft dog fighting on the endless sea of space. The films take the time to show us this, to let us know who and where all the pieces are on the board before things really get under way. The opening space battle in The Last Jedi is about a Rebel fleet trying to escape from an Imperial fleet. The Imperial fleet has a big battleship that can punch through the shields of the Rebel fleet's capital ship. That's it. That's all you need to know and it's set up in like thirty seconds in the film around story dialogue and other bits. The Rebels release all their ships to take out the big Imperial ship and then we get our quick cuts to each pilot's cockpit. More important than the score, we know the rules of the sport we're playing. The Rebels have a ship they want to protect, the Imperials have a ship they want to protect. The time limit is determined by when the Rebels can escape. Everyone releases their fighters onto the field and it's time to play ball. So much of modern cinema forgets to do this, or dices it up so finely that it is unrecognizable. So many fantasy movies with battles full of orcs and mystical beasts and big explosions and it's all meaningless, not because we don't know what the stakes are, but because we don't know how the game is being played. All we see is two mobs smash into one another interspersed with clips of our heroes cutting through mobs of faceless enemies while exchanging witty one liners. It's all fluff. I'd be hard pressed to tell you the details of any big, army sized fight scene in a Marvel movie for instance, or Lord of the Rings, but I can recall just about every space battle in every Star Wars film to date. I can tell why they were fighting, what they were fighting over, who was in the battle and where they were. I can tell you those things because the Star Wars films, all of them, the good and the bad, have taken the time to set their stage. In the Marvel movies, which are all great, often times our heroes are reduced to punching baddies until the plot timer goes off. Four or five of our team is left to thinning out the herd until one of them can reach the thing they're fighting over. And that's not to knock the Marvel movies. They've done a lot great work that puts the ten-thousand-cuts school of film editing in modern action movies to shame. But the reason why Star Wars is so enduring, why it is so memorable on top of the lightsabers and the Force, is because each of their battles are communicated to the audience effectively. Who, what, when, where, why? These are questions we're all familiar with, questions we all apply to our stories, but how many of us stop to ask them of our battles? Take Note is series where we examine a single idea or mechanic for designers to consider. 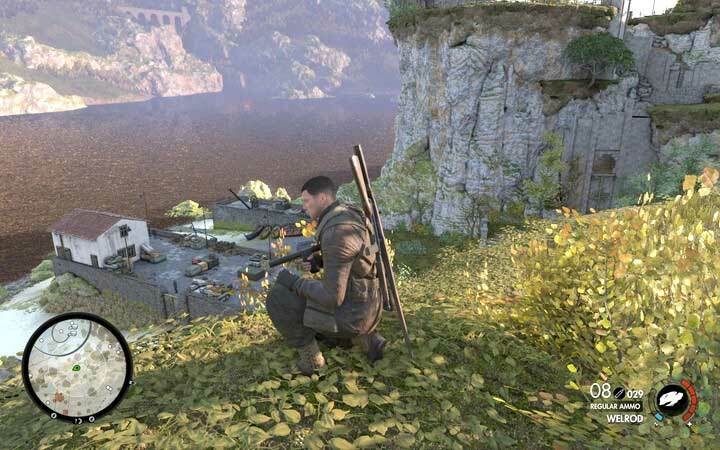 The Sniper Elite series by Rebellion is one of those titles that always seems to be on the cusp of a major breakthrough into the mainstream, but is never quite able to get there. I've been playing the series and its Nazi zombie flavored spin offs since Sniper Elite V2. 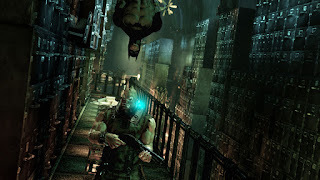 The series falls into the stealth action mold alongside titles like Metal Gear Solid and Splinter Cell. The games follow the exploits of Karl Fairburne, a ken doll looking sniper working for OSS during World War II. With each release of the game, the developers over at Rebellion have improved their design, refining a fairly basic sniper title into an excellent third person stealth action game. If the name of the series doesn't ring a bell, you've probably seen their best known mechanic, the bullet cam. I recently picked up the latest in the series, Sniper Elite 4, and was blown away by the level design of the game's first mission. In Sniper Elite 4, each mission takes place on its own open map, where the player can freely explore around the area, complete objectives and find collectables in the form of letters and reports. The maps give the player the freedom to tackle the objectives in which ever order they like, and explore the map's nook and crannies at their own pace. 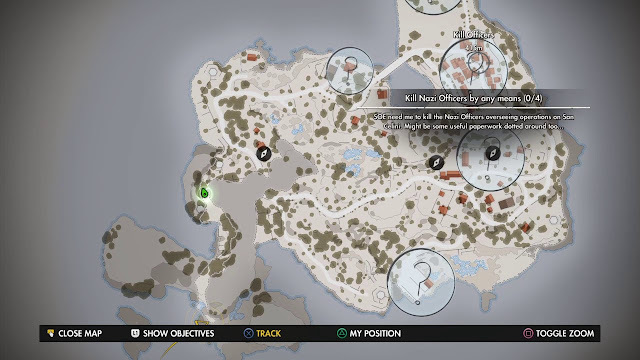 What at first appears to be a standard open world map slowly reveals itself to be a great example of level design. Each objective takes place in a desecrate combat zone that seamlessly blend together across the map. Each of these areas has multiple approaches from different directions. This allows the player to tackle them from what ever direction they choose and offer approaches for different play styles. A typical choice in the game may be to try and find a tower to snipe from, a hidden path to sneak around the encounter, or heading up the main road guns blazing. While stealth is a big component of the game, its forgiving enough to let players disengage from a fire fight, regroup and try again. The thing that impressed me most with the game, from the very first mission, is the change in elevation across the map. The game goes beyond adding simple towers to snipe from, to having massive changes in elevation across the same level. In the map above, the beach at the bottom of the map is down a steep cliff face, as is a pocket of beach further up the map. In most games that would be an inaccessible area. 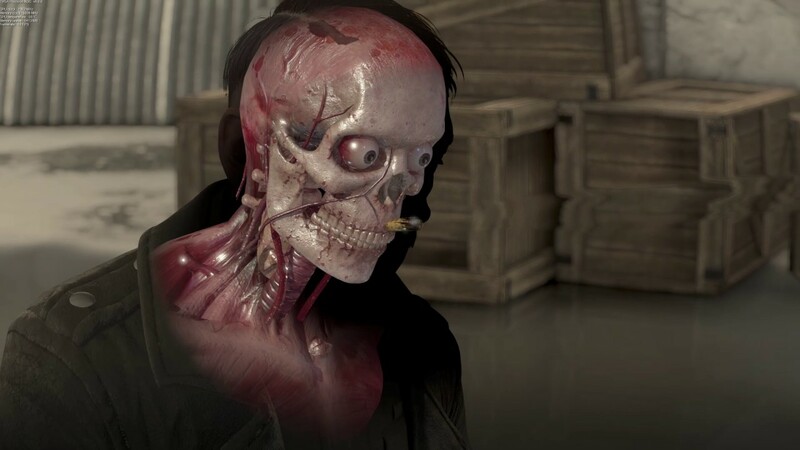 In Sniper Elite 4, it's not only accessible, one of the objects are located there. More subtle changes in elevation litter the map. Creaks and gullies below the main road that allow you to sneak past enemies, or hills cresting above that you can snipe from. While we've seen this type of difference in elevation in games before, Sniper Elite 4 manages to make it feel natural. Each path, each approach, is tied together in a way that makes it feel organic that other games struggle to pull off. In something like Far Cry, you may have a observation tower to snipe from, or a hill that crests over an encampment. Even in Metal Gear Solid 5, one of my favorite stealth action titles from recent years, the changes in elevation are often anemic. A building may have multiple stories, and the surrounding country side may have a hill or two, but they aren't enough to affect gameplay. There's really only one combat area in Metal Gear Solid 5 with a drastic change in elevation, that being the terrace area in the Afghanistan map, but even that is a linear progression from low to high. The rest of the game features the box stand cliff to observe from, but few actual changes in elevation. 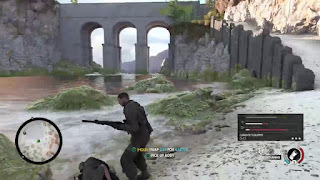 Sniper Elite 4 manages to tie its high, low and medium areas together in a way that gives the player options, allows for a variety of play styles and look natural in way most games do not. 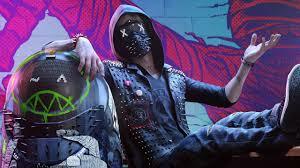 Watch Dogs 2 is an open world game in which you play a young activist hacker trying to expose the corrupt dealings of mega corporations that are selling people's private data to get even richer. It's not exactly new territory, but Watch Dogs tries to liven things up with a young cast who values having a good time just as much as making the world a better place. The game has this juvenile, Rage Against the Machine, down with the system vibe punctuated by neon greens and fluorescent purples. While not really my aesthetic of choice, I can at least admire how much the developers leaned in to it. They really went for it, going past the bounds of the expected, past even tacky until they broke all the through to a pulpy hacker tale wrapped in a cloak of hashtags, spray paint and memes. 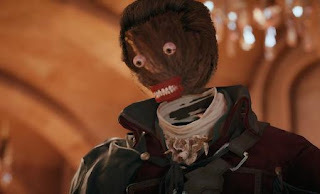 A photographic summary of this game's style. Throughout the game the player steals cars, hacks cameras, pilots drones and causes all kinds of mayhem in the name of sticking it to the man and pulling the wool off of people's eyes. Overall, it paints a picture of the fun, carefree revolutions of the young who don't have to worry about logistics or the impact of the consequences of their actions. While not exactly realistic, it works for the game. It takes an average young black man and turns him into what amounts to a superhero all thanks to a cell phone and a few hundred lines of code. The biggest issue I've had with the game so far comes not from its campy attitude or instance on packing a pop culture reference into nearly every line of dialogue, but from the combat. The mechanics are typical open world fair. You have guns, a stun gun for those wishing to go non-lethal, and a bare bones cover system to help when you're in a tight spot. Additionally, thanks to your hacker skills, you have additional options like sabotaging power boxes or making gas pipes explode. This is largely what the industry has come to expect from this style of open world game, from Game Theft Auto to Mafia III and even Infamous, battles often devolve into combat arenas full of goons with bad A.I. to slow you down from reaching your objective. In Grand Theft Auto or Mafia III, the thought of gunning your way through mobs of enemies fits in with the overall themes of those games. In Grand Theft Auto you're a criminal, either currently or previously, so the thought of killing people should come as no shock. In Mafia III, you play a mafia underling turned special forces veteran who's out for revenge, closer in sensibilities to the Punisher rather than Batman. In Watch Dogs 2 however, you're supposed to be a good guy, not really an anti-hero. Your idea of braking the law is more stealing a car or breaking an entering and less cold blooded murder. Watch Dogs 2's combat leave you little options. Sure, the game gives you a stun gun, and a variety of tools to hack your way into and out of situations, but even a slight misstep will result in your death. See, the guards in Watch Dogs 2 don't really make sense. Mixed in with the average pistol armed rent a cops are guys with military rifles and automatic shotguns, not to mention the guys in head to toe ballistic armor. And this isn't in super secret installations either, regular street thugs and paid by the hour security guards walk around with fully automatic shotguns. Even crazier, when seeing a trespasser, their opening move is to fire at will. See a suspicious person? Don't bother asking them to leave, just mow them down with a military grade weapon for no reason. This encourages a lethal play style, of which the game is all to ready to push you toward. While it starts you off with a non-lethal stun gun, ever other weapon in the game that you can either buy or pick up is a fully lethal gun of some variety. The blood thirsty guards add to this by opening fire with little in the way of warning. A slight misstep in the game's limited stealth mechanics means two or three guards will begin opening fire with their guns while a fourth calls for reinforcements. This game is ready at any moment's notice to drop a dozen heavily armed goons on your for simply being seen in the wrong place at the wrong time. It's more than bad A.I. and bad level design, it undermines a lot of what the game is going for. When I first started the game I thought I would go non-lethal. Between the aforementioned stun gun and the game's melee attacks, I figured I'd have a good time sneaking through the shadows, hacking terminals and being this "for the masses" hacktivist the game wanted to make me. Unfortunately, within two missions I was facing fully armed swat teams that were best taken out by the tried and true method of finding the biggest gun in the place and slinging lead like I was auditioning to be the next Rambo. It's an even bigger shame when the game so clearly demonstrates that it's capable of so much more. In one mission, I was tasked with infiltrating this warehouse along the docks, getting an access code and then stealing a truck full of electronics. The place was patrolled by over a dozen guards armed with pistols, shot guns and rifles, and stealth wasn't getting it done. Instead, I solved the problem by remotely hacking my way between cameras in order to get line of site on the truck. Having already acquired the access code to the gate, I used an upgrade ability to remote pilot the truck through the docks and out of the warehouse. While the guards were running around trying to figure out what was happening, my character was standing smoothly across the street, using a tablet to drive the stolen truck to a perfect stop inches from where he was standing. And that's where the missed opportunity comes in, that's where the game missed its chance to be more than your average third person, open world, mass murder simulator. What the game should have done was make you Batman. 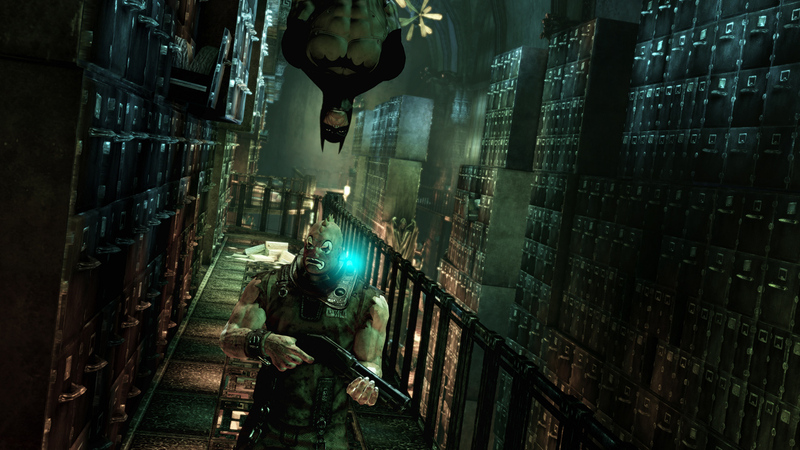 The Rocksteady Arkham games have become well known for their combat. It's become a colloquialism to say it has "Batman" combat. The Assassin Creed style, protagonist surrounded by bad guys with an attack, dodge and counter to help you jump from enemy to enemy and chain up large combos. That's not the part of Batman that Watch Dogs 2 needed. Watch Dogs 2 need the other part of what made those games so enjoyable. 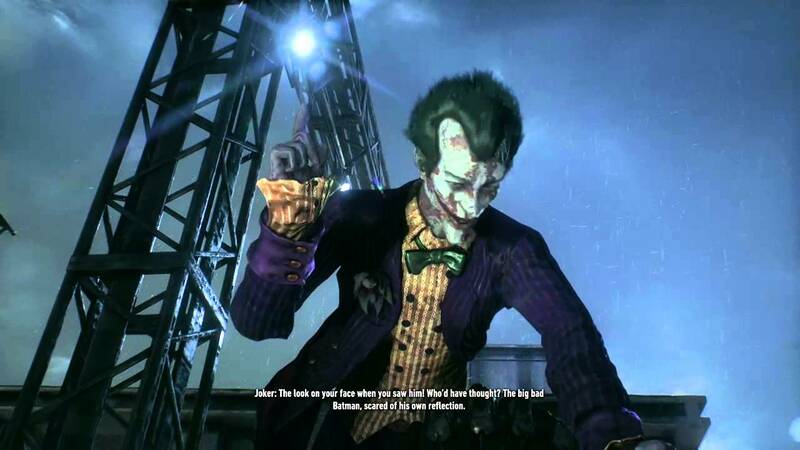 The Rocksteady Arkham games were at their best when forcing you to think like the bat. You have a room full of six guys. Two with electric batons, two with shields and one with an automatic rifle. The combat encounters were not just battles, but puzzles. Get the gun guy first, swooping down from a gargoyle to tie him up. Then get rid of those annoying baton guys with a swish of the cape. Flip over the shield guys and hit them from behind. Take out the last guy with a reflexively thrown batarang. Those games gave you a host of different abilities and then forced you into situations in which you needed to use them effectivly in order to come out unscathed. Watch Dogs 2 feels like they started to go down this road, with electric panels placed around the environments that can shock enemies, and abilities focused on luring opponents, but then never does anything interesting with them. Back in the PS2/XBOX days, it was common to have a game in which the only way to solve a problem through combat was in giving the hero a gun and letting them kill as many folks as possible. And make no mistake, I love my fair share of running and gunning video games, but in the modern era, gamers expect something more. They expect the thematic elements to resonate with one another. Watch Dogs 2 either doesn't get this, or willfully disregards it in the name of presenting the player with a false choice of non-lethal or lethal, while pushing them into a world of blood thirsty murders. I think the game would have been far more powerful, and the engagements far more enjoyable if instead of presenting the player with killing fields full of a few stealth elements, they approached the game more like one of the Batman games by giving the player gadgets and choices that allowed them to control the battlefield in ways that didn't feel like one off magic tricks or electrifying gimmicks. At the very least, a different approach to the guard's A.I. would have made a non-leathal, or at least less lethal path more viable. Look at Hitman, where when caught trespassing guards ask you to leave before moving into combat. Even when moving into combat, they always attempt an arrest before going into murder mode. Both of these would have done a great deal to helping the guards in Watch Dogs 2 feel more like people and less like brainwashed drones who need a blood fix. The story would have also benefited. The carefree attitude and pop culture obsessed nature of the characters starts off making them endearing. It makes them seem like real people, young people, up against impossible odds. But after a few instances of walking into an innocent movie studio and gunning down a few dozen people, or killing the hundrth security guard that was just doing their job, it no longer feels so carefree. Instead it feels rather blind to the people they claim they are trying to save. It ends up with this dude-bro culture of refusing to acknowledge consequences, much like Ubisoft's other big open world hit, Far Cry 3. The whole thing comes off as tone deaf, as blind to its own message when it could have been so much more. The thought of young hackers, of people trying their best to make the world better through their skills and ingenuity, rather than their marksmanship or willingness to kill as many as it takes is a message modern video games could benefit by exploring. The creators of Watch Dogs 2 had a real opportunity to take a young, black protagonist and make him someone that refused to kill even when met with lethal force, much in the same way as Batman. Through gadgets and cleverness, the protagonist of Watch Dogs 2 could have come across as an upcoming, amateur vigilante that was trying to save people, to make the world a better place. Instead, he comes across as a childish sociopath who goes on murder sprees in-between stealing cars and making youtube videos with his friends. In the end, I was left wishing Ubisoft had made the protagonist of Watch Dogs 2 something a little more Nightwing, and a little less Jason Todd. Almost exactly a year ago I played X-COM 2, Firaxis's follow up to the wonderful X-COM: Enemy Unknown reboot from a few years prior. I was rather disappointed with their sequel. While the X-COM games have always been difficult, even oppressive, I found X-COM 2 to be more frustrating than fun. At the time I chalked this up to a decision to add in mission timers and stress in my own life. I just wasn't in the right place mentally for slamming my head into a wall. A year later and on the eve of a major DLC release for the game, War of the Chosen, I decided to revisit the base game and give X-COM 2 another shot. An additional 12 hours of gameplay later (bringing me up to a modest total of 19) I have a similar, though better understanding of what I found so frustrating the first time around. The X-COM reboot saw a pretty familiar Earth invaded by an alien menace like so many pulp stories and summer action films. A secret organization of government officials band together to push back the alien menace. The Commander leads the organization, developing new technologies, training recruits and fighting back against the alien tide. The second X-COM envisions a world in which humanity lost that war. The aliens have arrived, taken over and rule with an iron fist. X-COM is no longer a global organization of futuristic technologies, but a rag tag band of rebels fighting in isolated cells, using whatever scraps they can find along the way. The game opens with them rescuing the Commander from the first game, leading to what was for me the best moment in X-COM 2. The voice actor who delivers that line is absolutely perfect. It's a great set up and an interesting way to build off the first game while still leaving players in that underdog, against all odds position. The Commander, using a massive airship as his base, flies from place to place, building contacts with the resistance, researching the alien's technology to use against them and probing the enemy's defenses for soft targets they can hit with lightning efficiency. So where does it all go wrong? In my first playthrough of X-COM 2 I blamed the mission timer for much of the games unneeded difficulty. To add to the theme of outnumbered and outgunned rebels fighting back against a totalitarian regime, the game adds an arbitrary turn counter to many of the missions. You have eight or nine turns to complete your objective and get out. Fail to complete the objective in the allotted time and your entire squad becomes captured, even if they were in a defensible position they could otherwise have escaped from. To add to this, in the meta layer of X-COM 2, they eschew the global panic of the first game for a more ominous and vague "Avatar Project". In the first game, failing missions or neglecting certain regions would increase a level of panic in the region. If the panic reached too high a level, that region would pull out of the global initiative and decide to fight for itself. Lose too many regions, and it's game over. It was a meta level threat that made sense thematically. Nations consumed by fear, losing confidence in a world government leaving them to die deciding to go home and bunker down, defending themselves first and foremost. Lose too many regions and the world couldn't hope to stand against such a sizable threat. The themes of all for one and one for all felt at home with the game's larger message, of diverse groups banding together against a common threat. In X-COM 2, all of this goes out the window in favor of the Avatar Project. A red bar at the top of the world map shows how far the project is progressing. At certain times facilities appear on the map, targets which if destroyed will delay the completion of this mysterious project. While a weaker threat narratively, it does force the Commander to go on the offensive, taking the fight against the enemy even when the odds are against them. Unfortunately, the odds are the problem. Saying the Random Number Generation (RNG) is bad in X-COM is nothing new. It's like saying Nintendo panders to kids or Dark Souls is hard. The problem is that the RNG in X-COM is not just bad, not just poorly balanced, but instead serves to highlight fundamental weaknesses in the design. Some of these were present in X-COM: Enemy Unknown, others are new to X-COM 2 but all serve to highlight how a fault in one critical piece can bring the entire machine down. RNG, essentially programmed dice rolls, control the accuracy of how your guns shoot in X-COM 2, it decides how much damage those shots do and it decides whether getting hit means a wounded soldier or a dead one. A great many games do this to a lesser or greater extent. The Achilles heal of X-COM 2 is that the entire game hinges on them. In the tutorial players are taught one of the most vital tactics in the game, using an ability called Overwatch to lure in and ambush enemy units. Overwatch puts units in a guarded state, making them shoot enemies if they move within their line of sight. Add to this the knowledge that enemies always get a free move when revealed and it becomes clear that Overwatch is essential to surviving in the game. The situation unfolds as such, if you move your units and reveal enemies, those enemies get a free move to get into defensive positions. Then on their turn they are in a good position to attack you. If however, you have units in Overwatch, when the enemy's free move is triggered, your units will attack them. This basically, though not exactly, gives your units a free attack to counter their free move. It is the basic building block of the game's strategy and impacts almost every decision you'll make. Except that those Overwatch attacks are also decided by RNG. On occasion after occasion while playing X-COM 2, I would have my troops in the perfect location, everyone behind cover and in Overwatch and trigger an enemy movement only for the entire squad to miss. Now some of this may be bad luck, but when you add on to it the turn timer ticking down, the punishing damage that every enemy does, the sheer weight of the operation coming down on you, it's heartbreaking. Aside from causing me to pound my fist on the desk in frustration or curse at my monitor, it really breaks the illusion the game is trying to create. Here I have an entire squad of trained, battle hardened soldiers fighting with assault rifles at ranges of 30 ft. or less and they can't hit a super mutant the size of Andre the Giant? It doesn't make any sense for one of them to miss much less all of them. Time and time again through playing X-COM 2 I would have a soldier aiming at an enemy three or four squares away, a distance of maybe 20 ft. with an assault rifle and their chance to hit would be around 70%. That's insane. Give an untrained person a pistol and have them shoot at a target twenty feet away that's eight feet tall and two feet wide and try and tell me they'll miss more than 70% of the time. And these aren't untrained civilians. These are trained soldiers, sent into battle after battle, promoted for their efforts on the field. So they miss? So what? Shoot again. After all, that's what you would do in the first game. You might take some damage or lose a soldier in the process, but that's all part of X-COM, that is in some way part of the fun. But in X-COM 2 there are prices for that failure. You aren't just losing a soldier, you're losing a turn on a timer, maybe one of only eight for the entire mission. Not only did all your soldiers miss and someone die, but they are going to have spend the entire next turn shooting at enemies that should already be dead, and they'll have one less gun to do it. And this, finally, brings me to my point. When is a game merely difficult, and when does it cross over into a flawed or poorly executed design. X-COM has always been hard. That's part of it's charm. A hard pressed Commander fighting impossible odds with less than ideal tools to do it. Make a bad decision, send your troops to a position they can't defend and you pay the price for it. A soldier falls on the battlefield and another name is added to you memorial wall. You got into the next battle not with an experienced veteran, but a rookie prone to panic. Your actions and your choices have consequences, making those choices more interesting. But in X-COM 2 you aren't punished for you decisions, you aren't punished for attacking when you should have defended or going left when you should have gone right. You are punished for dice rolls you can't even see. Put a squad in Overwatch, use the tactics the game teaches you and watch as they all miss. Watch as they fall on the battlefield while an arbitrary floating timer decides you're out of time, out of chances. Watch as the game decides everyone on the ground was captured, when they could have easily escaped. Super Meat Boy and Dark Souls are two of the poster children for difficult but rewarding games. They are trotted out when anyone says a game is hard. Oh you think this is hard, you should try Dark Souls. Both of those titles are not without their faults and there's more than one unfair death to be found in the Souls series, but there are a few crucial differences. The first is control. In Super Meat Boy, a harrowing, nail biting platformer, you have some of the best control of your jump to be found in the entire genre. The cause of this is pretty simple. When you die in Super Meat Boy it's meant to be your fault, not the game's. You missed the jump, you screwed up the timing. In Dark Souls the enemies are punishing, capable of dealing great damage, but they have patterns and wind up animations to show you what's coming. You can learn and adapt. You can't learn a dice roll. You can't control the whims of fate. Sure, you can start relying heavily on grenades and the few other items in the game that are guaranteed hits, but this is far from the intended design. You can research new equipment and unlock better gear, but how many players will get that far, how many Commanders will trust them when it all comes down to a roll of the dice anyway? Secondly, in both the titles listed above, any setbacks from these failures are temporary. Levels in Super Meat Boy are short and load times instant so that no matter how frustrating of a death you just suffered you're back in the level and jumping before you can even think to throw the controller. In Dark Souls, dying cost you souls, the currency used for improving the stats of your character, but even this is only a temporary set back. New souls can always be gathered. There's no permanent price of failure like there is X-COM 2, no Avatar Project always getting a step closer to completion. Difficult games often get a pass. Criticism isn't justified, it's simply the complaining of someone who needs to get better at the game, who needs to stop whining and learn the strategies to beat it. In some ways I would agree with that, but in X-COM 2 it isn't the aliens I'm fighting, it's the dice. Chance is a fundamental part of the X-COM series. In war, nothing is guaranteed, nor should it be. What I contend is that the developers need to pay careful attention to how these things are balanced, and the effect they have on the larger game. Without the turn timers, the missed attacks and botched die rolls become far less of a set back. Without the Avatar Project, losing a squad to chance means building a new one, rather than suffering a permanent setback that could result in the loss of an entire several hours long campaign. There is much to like about X-COM 2, in the story, in the presentation. In the weapons and gadgets they give, in the varied enemies they send you to fight against. It's a shame I won't see more of it because I'm not willing to gamble any more of my time on a game that feels more rigged than fun, on something that feels more cheating than challenging.